Education companies can partner with educational entities to apply for new federal funds aimed at STEM learning and computer science education in K-12 schools. Two U.S. Department of Education programs are open for applications for fiscal 2018, with deadlines fast approaching. Each program has a focus on expanding access and effectiveness of K-12 instruction in science, technology, engineering, and math (STEM), as well as computer science. The Supporting Effective Educator Development (SEED) program is a competition with $75 million in funding, and the Education Innovation and Research (EIR) program offers a total of $120 million in grant funding. Awards and funding will be announced in the fall. Both programs are authorized under the Every Student Succeeds Act (ESSA). Companies and nonprofits are eligible to apply for both programs as long as they partner with the appropriate educational entities, and follow the respective guidelines. They cannot be the lead applicants. Details about these grants come from the department’s recent announcement, websites for the grant opportunities, and a U.S. Education Department webinar outlining more information about the two programs. The SEED program’s purpose is to provide grants to increase the number of highly effective educators, by supporting the implementation of evidence-based preparation, professional development, or professional enhancement opportunities for educators. Its focus is on helping classroom teachers, principals, and school leaders improve STEM or computer science outcomes. More information about the SEED program is available here, and 2017 award winners are on this list. 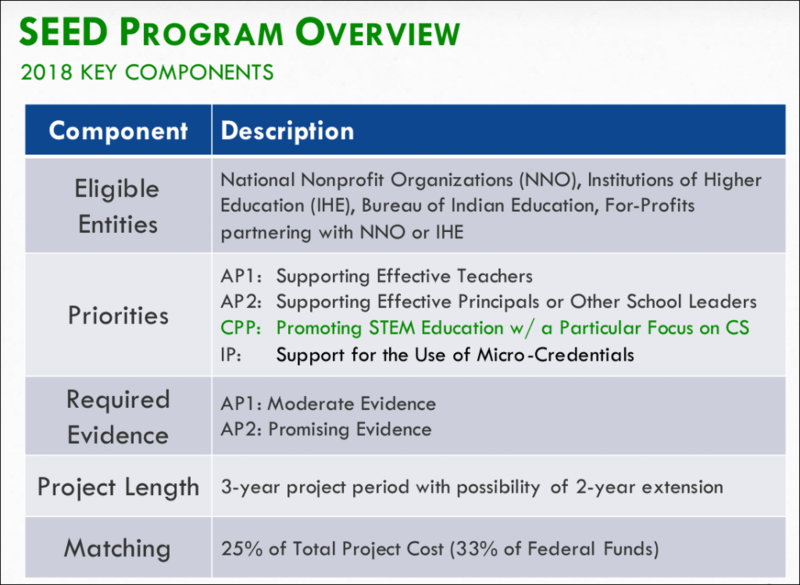 On the slide below, “AP” refers to “absolute priorities,” and “CPP” to “competitive preference priorities.” Applicants must choose one of the absolute priorities to be eligible for the program. The competitive priority has to do with STEM with a focus on computer science, and “IP” stands for the invitational priority, which in this case explores the use of micro-credentialing as part of the program. Under the SEED competition, for which applications are due Thursday, May 17, businesses are eligible if they partner with a university or a national nonprofit organization, according to the department. All grantees must match 25 percent of the total project cost—a contribution that could be met in various ways, including discounting services for grantee partners. The Education Innovation and Research, or EIR program—which for the second year succeeds the Investing in Innovation or i3 program—requires applicants to primarily target their proposals to high-needs students. The deadline for applications is Tuesday, June 5. President Trump directed the EIR program to award $50 million to STEM-focused projects for fiscal year 2018. 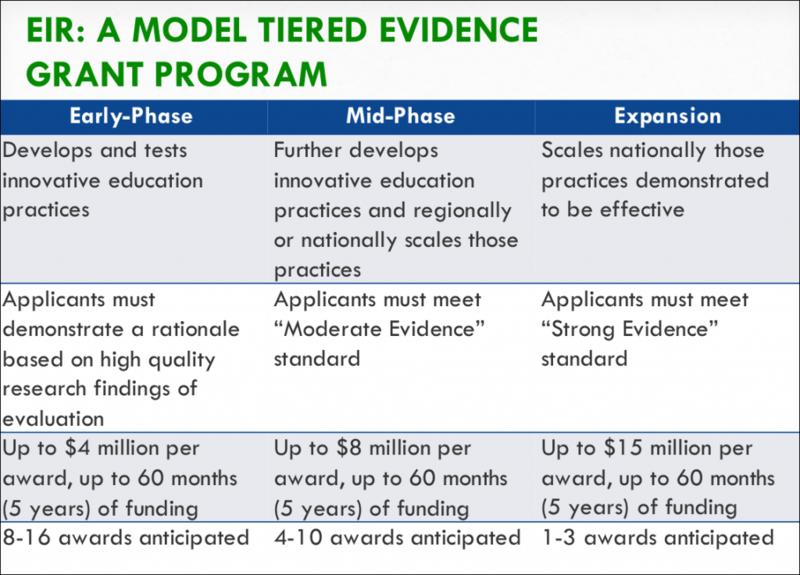 The EIR grants allow for three levels of funding, each tied to the levels of evidence in the proposed solution. Local education agencies, state education agencies, Bureau of Indian Education, and nonprofits are eligible to apply as the lead applicants, and businesses can partner with them. Also qualifying as an LEA is a public charter school. To be eligible, applicants must provide for 10 percent matching in cash or in-kind contributions. Under early-phase EIR grants, funding is provided to support the development, iteration, implementation, and feasibility testing of practices that are expected to be new and significant relative to others that are underway nationally. The education department is looking for novel practices that can improve achievement and educational attainment for high-needs students. In all areas, applicants must meet certain “absolute priorities,” and have the option of adding either “personalized learning” or “early learning and cognitive development” to their applications—although neither of these last two will contribute to the scores for awards. How easy would it be for others to implement this practice? How can I use data from early indicators to gauge impact? What changes in implementation and student achievement do these early indicators suggest? Mid-phase EIR applicants must meet a “moderate evidence” requirement, and support the scaling of its projects to regional or national levels. The projects should refine and expand use of practices with prior evidence of effectiveness in order to improve student achievement and educational attainment for high-needs students. They are also expected to generate important information about a practice’s effectiveness and cost. In what context does the practice work best? Where does it not work well? What components of a practice are most critical to its success? How should the cost structure of a practice change as it scales? What are ways to facilitate implementation fidelity without making scaling too onerous? More information about the EIR program is available here, and the 2017 award winners of EIR grants are on this list. Filing an “intent to apply” is not required to be considered for either a SEED or EIR grant award, according to the department.